The blorple spell, "explore an object's mystic connections", is used to move the action to different areas. Casting it on most objects transports the player to a featureless room with one exit that returns them to their starting point. When cast on the sixteen small white cubes found throughout the game, the player is transported to a distinctive room with multiple exits that transport them to a variety of locations. The player begins the game with a burin (an engraving tool) which they can use to inscribe words on the otherwise featureless small white cubes; those words can then be used to refer to the cubes (notably, as the target of blorple). Among the game's feelies were a set of trading cards with facts about famous enchanters. At one point in the game, the player encounters their old master, Belboz, now in retirement, who asks the player a question about one of the enchanters. If they answer incorrectly, the game continues, but it becomes impossible to reach the climactic scene of the game. Spells have a chance of failing when cast, and certain of the white cubes enhance spells' power. Screenshot of Spellbreaker showing the "Mage" title. The initial codename in Infocom development of this project was (likely facetiously) Z6, or "Zork Six". However, the working title quickly became "Mage". The intention was to continue the previous tradition of naming the post-Zork fantasy adventures after positions of wizards (Such as Enchanter and Sorcerer). Infocom's marketing department resisted this name, insisting that a one-word semi-obscure term like Mage would not sell well. After some contention (and an attempt to use the name Archmage) the title Spellbreaker was chosen and used. It is referred in its packaging as the third game in the Enchanter Series. Regardless, the commercial release of Spellbreaker calls itself Mage every 100 or so reboots. Spellbreaker (Dave Lebling; publisher: Infocom; 1985; Z-code 3). Spellbreaker (Dave Lebling; publisher: Infocom; 1985-86; Z-code 3). 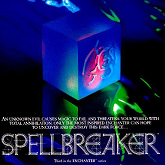 Spellbreaker is available on the Classic Text Adventure Masterpieces of Infocom CD.